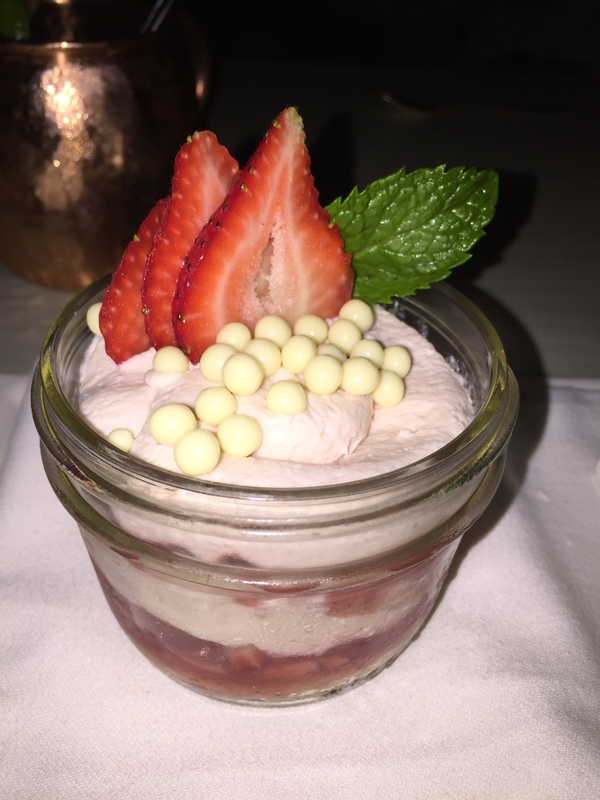 During our first stay at the St. Regis Monarch Beach, my husband and I dined at Michael Minna’s Stonehill Tavern, and had a terrific time. My husband raved about that meal for many, many months afterwards. So we debated back and forth on whether or not we should have dinner again at Stonehill Tavern during this stay at The St. Regis. However, there was another restaurant on the hotel property that we had looked at the first time we stayed here and didn’t try out. We figured this would be as good a time as any to give this other restaurant try before we run out of future chances. 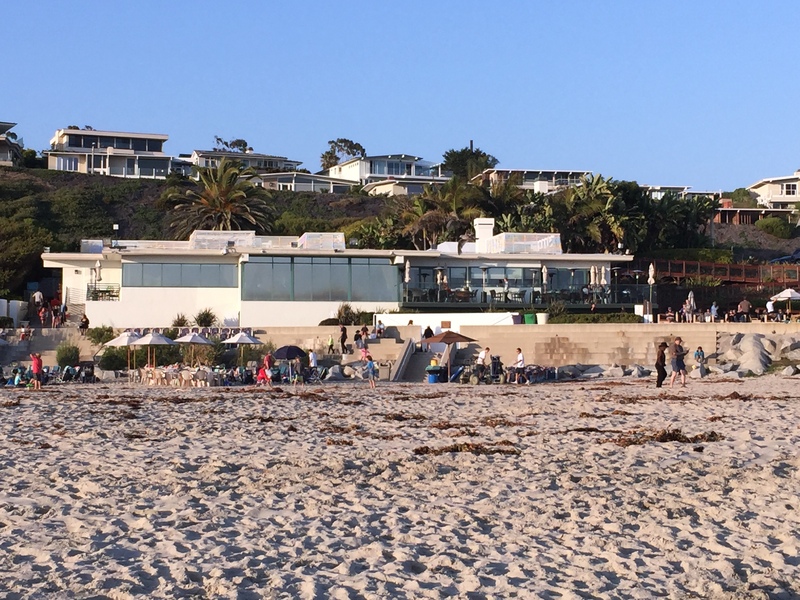 The Monarch Bay Club is a private membership beach club located on Monarch Beach in Laguna Beach. The St. Regis has a partnership with the Monarch Bay Club allowing hotel guests exclusive use of Monarch Beach and all of the amenities of the club, including the bar and restaurant. 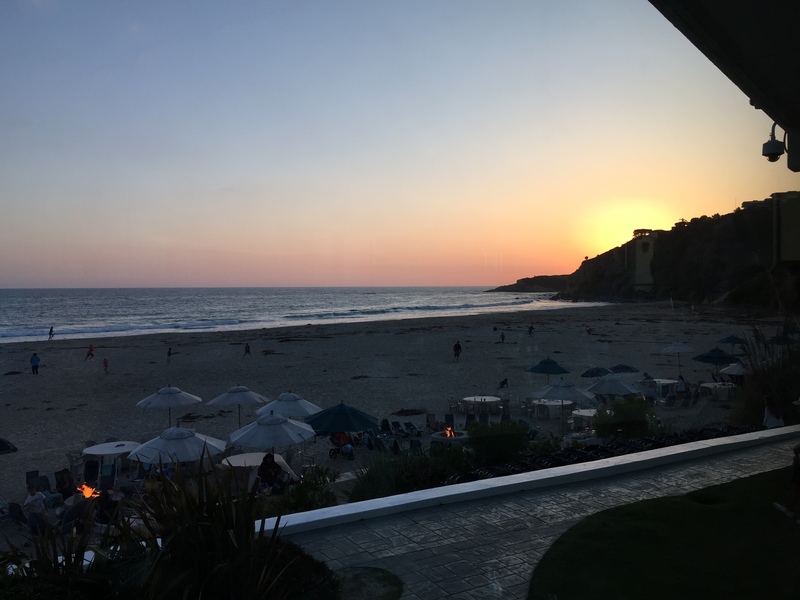 My husband figured out what time sunset would be on the night we were staying at the restaurant and made a reservation for dinner shortly before sunset so we could watch the sunset over the cliffs surrounding Monarch Beach. A nice intimate, romantic dinner that I was really looking forward to. My husband decided to order a Moscow mule to drink. I’ve never seen him order a Moscow mule before, but we had recently dined at a restaurant where the Moscow mule was their speciality and we had seen a number of mules ordered at tables surrounding us. So, when my husband saw the Moscow mule on the restaurant’s cocktail menu, he decided to give it a try. Our waitress informed us that the restaurant had actually just gotten a new shipment of copper mugs specifically for the Moscow mule. Made with Ketel One citron vodka, fresh lime and ginger beer the drink smelled really good. Must have been the ginger beer. 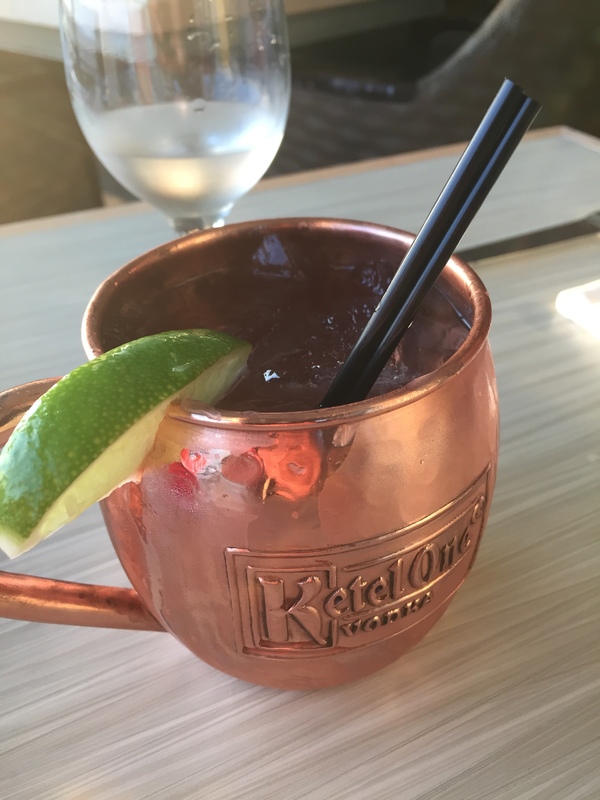 My husband enjoyed the taste of the Moscow mule and thought it was made with the right amount of liquor so that it was tasty, but not overpowering. The meal started out with some bread and butter being served at the table. The assistant waiter came around the table with a basket full of fresh baked, hot-out-of-the-oven bread that we could choose from. I chose a cheese roll. Smear a little fresh whipped butter that melted right on the hot, steaming roll, and it was delicious. To start the meal, my husband wanted to get the cheese & charcuterie board served with fig cake, quince, and dark ale mustard. Have I mentioned how much my husband loves cheese? Unfortunately, when the board was brought to the table, we weren’t given a description of what the different meats and cheeses were, so we had to kind of guess for ourselves. 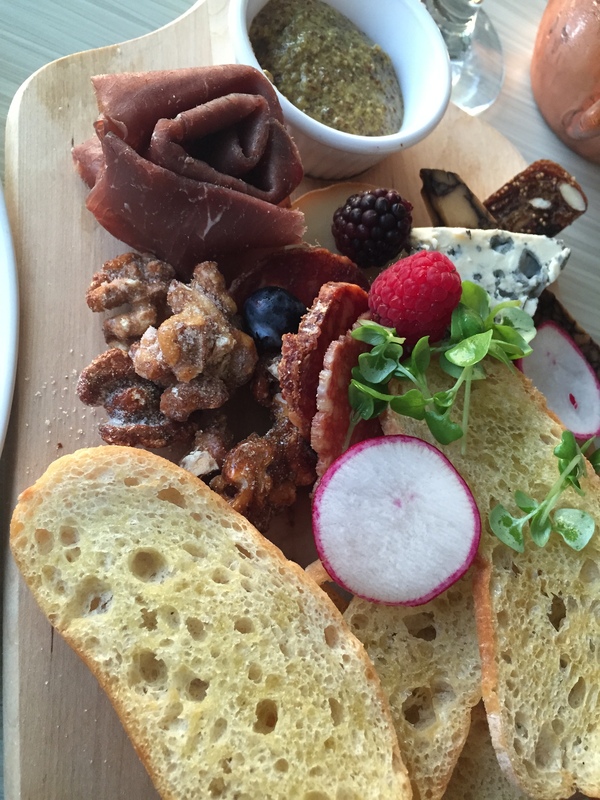 The charcuterie portion included several different kinds of meat, including prosciutto, and salami. The cheese included a soft cheese, a blue cheese and a very aged cheddar cheese. The accompaniments of the walnuts and the fresh berries and the radish were nice, without being candied or having the fruit turned to jam, and without the crostini being toasted, the cheese & charcuterie board could have been much better. For me, it was a bit of a disappointment. I chose to order the jumbo lump crab cakes for an appetizer. Served atop a green olive & corn salsa and an espelette aioli, the jumbo lump crab cakes were large, filling, and incredibly crispy on the outside. They were perfectly cooked to a nice golden brown, but yet fully cooked and hot on the inside. Filled with sweet crab meat, I really enjoyed the crab cake. 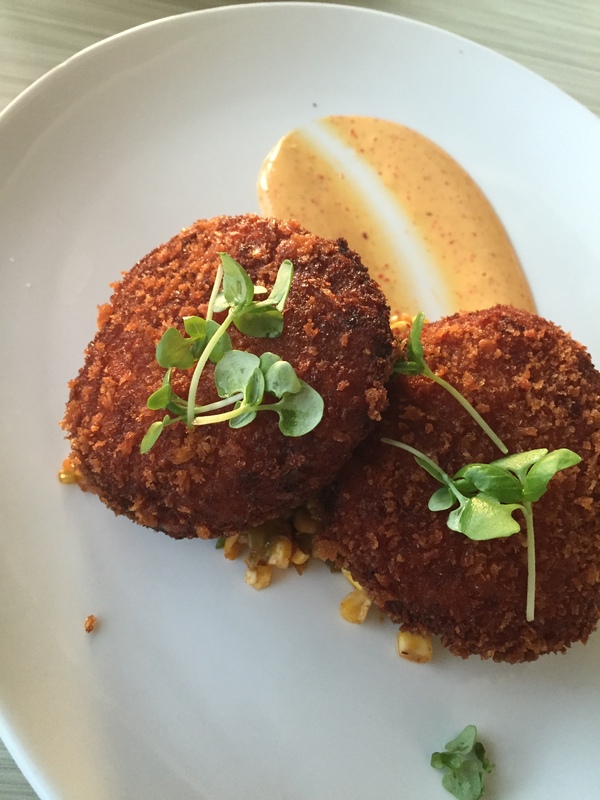 Though, you’ve really got to do something bad for crab cakes to not be enjoyable. The aioli had nice tang and a little bit of spice without the heat to it. And while the corn salsa looked delicious, I don’t like green olives, so I must say I didn’t even give them a try. For my entree I ordered the grilled Harris Ranch beef tenderloin. 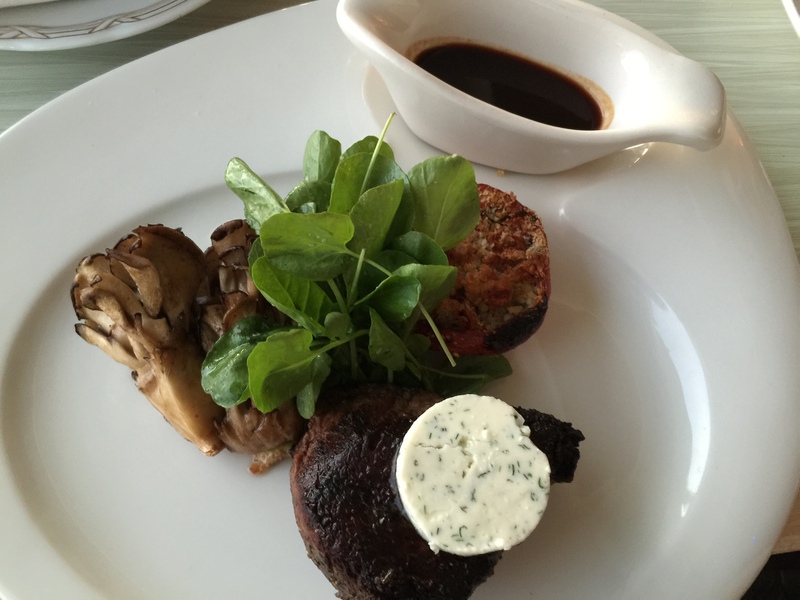 Served with blue cheese roasted tomato, hen of the woods and a side of Bordelaise sauce. The hen of the woods, which I suspected was a mushroom, but wasn’t sure about before I ordered it, was ginormous. I don’t think I’ve seen mushroom so big before. It’s too bad I don’t like mushrooms. The blue cheese roasted tomatoes was absolutely to-die-for. Roasting the tomato brings out some of its natural sugars that begin to caramelize. Topping that off with the tangy blue cheese is the perfect complement. I could eat a plate full of this. The tenderloin itself was really good. Perfectly cooked to the medium rare that I had requested, the compound butter served with the steak melted to create a creamy, rich flavor, combined with the delicious Bordelaise sauce and the meat was perfect. A very filling and gratifying dinner. 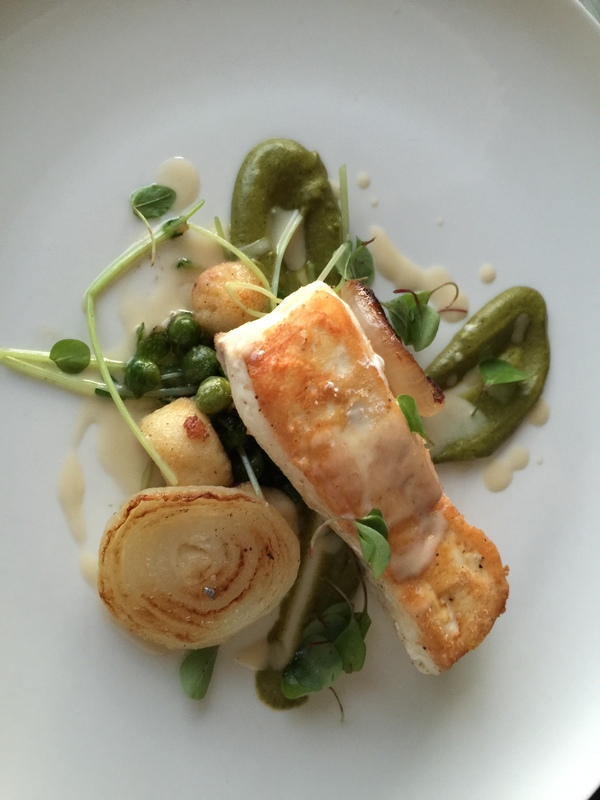 My husband ordered the pan seared Alaskan halibut for his meal. If he hadn’t ordered this, I probably would have. Served with ricotta gnocchi, green garbanzos, cippolini onions, pistachio puree and lemon beurre blanc, the dish was flavorful and complex. The halibut was cooked nicely with a nice outer crust and flaky on the inside. It was the accompaniments to the fish that my husband considered the star of the dish. There were undercooked peas that he thought were fabulous. Undercooking them meant they weren’t mushy, but rather had a bit of bite to them that provided nice texture. But the cippolini onion and the potatoes with the lemon beurre blanc sauce were my husband’s favorite part of this dish. 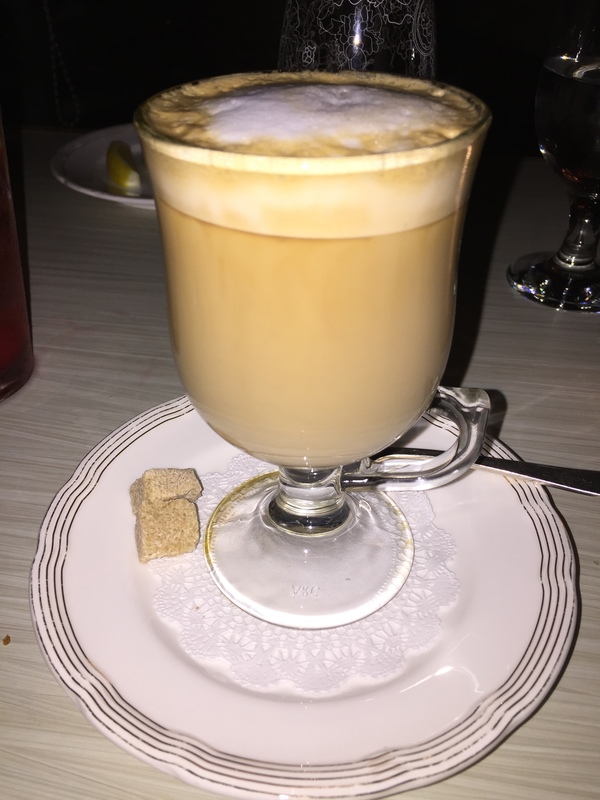 When it came to dessert time I couldn’t help but order a latte. A beautiful evening watching the sunset and seeing the waves crash upon the shore while being amidst the salty sea air, I wanted to prolong our time at dinner for as long as possible. Plus, nighttime right on the coast gets a bit chilly, so a nice hot cup of coffee would be the perfect way to ward off the chill. A nice touch to serve the latte with raw sugar cubes. I think I’ll take a couple to stir into my drink. Yummy and refreshing all at once. Perusing through the dessert choices, my husband and I decided to each order our own desert because we couldn’t agree on one to share. I chose to order the profiteroles. I was a little scared at what size these would be because profiteroles could be really big, or they could be small and bite-sized. And while I wanted dessert, I didn’t want to be overwhelmed. 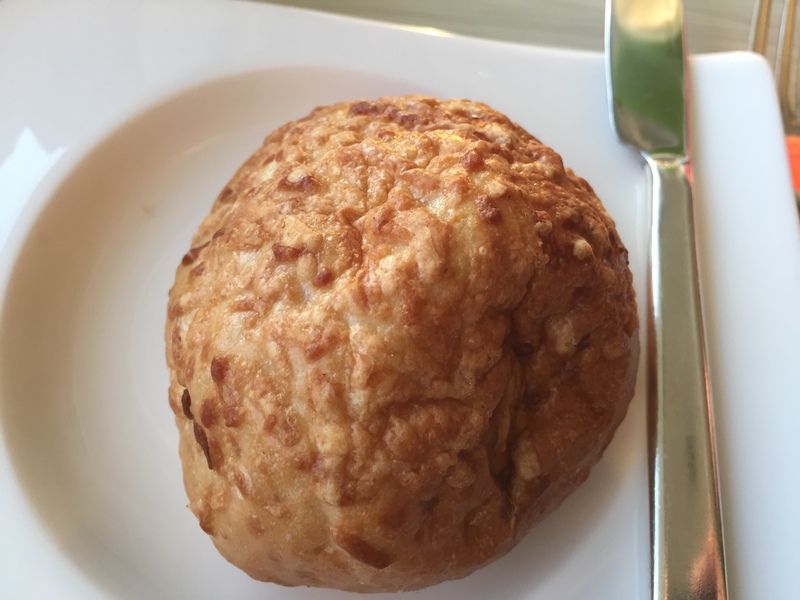 Our waitress assured me that these weren’t too big, pretty much the size of a cream puff and only 3 came in a serving, so she thought I’d be ok. I decided to trust her on this. 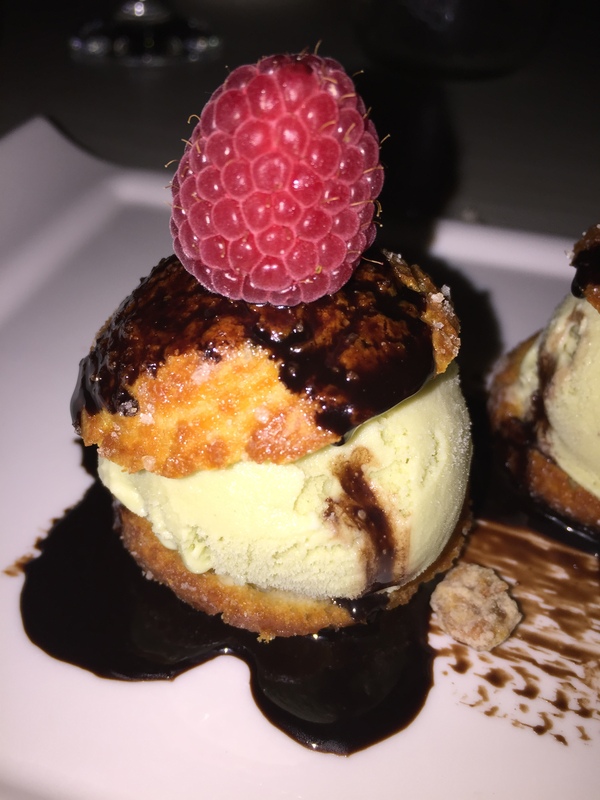 The profiteroles, made at Monarch Bay Club, are filled with Sicilian pistachio gelato, drizzled in warm chocolate sauce and served with fresh raspberries and candied pistachios. I’ve ordered profiteroles before that were just swimming in chocolate sauce that it was almost like eating chocolate soup and it became too overwhelming. I was pleasantly surprised by how well put together these profiteroles were. The choux pastry for the profiteroles themselves were done well and there was a good amount of ice cream stuffed in each profiterole and finally just the right amount of chocolate for the chocolate flavor, but without drowning the dessert in chocolate. Normally, I’m not a fan of pistachio gelato, or really pistachios in general. I can eat them, but wouldn’t willingly order this flavor ice cream or buy the nuts themselves. 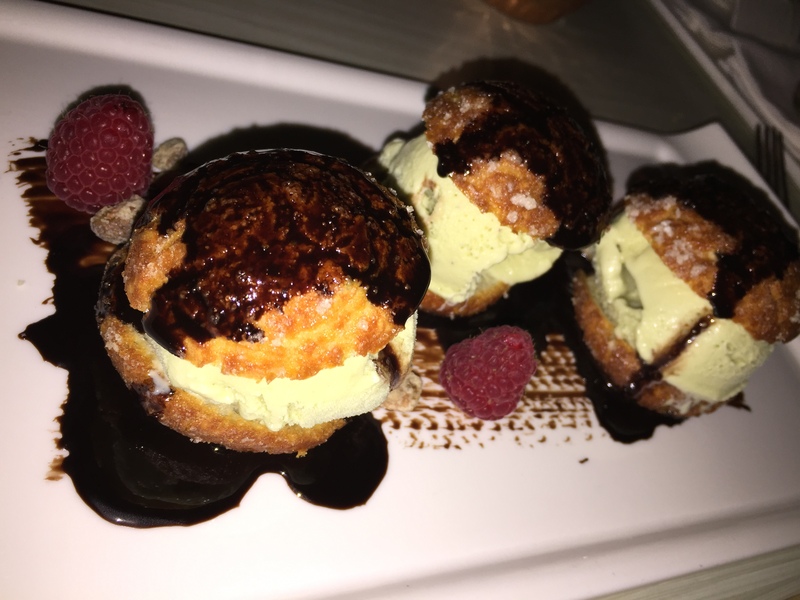 But, I was pleasantly surprised at how much I thought that the very subtle nutty flavor of the pistachio worked really well in this profiterole and combined with the sweetened chocolate sauce and the pastry dough. The profiteroles were just the right size and I surely enjoyed this dessert much more than I originally thought that I would. My husband had a dessert that I probably wouldn’t have ordered, but ended up being to-die-for. He ordered the lemon pound cake in a jar. This dessert, by its description, is right up his alley. Served with whipped mascarpone, strawberry compote and lemon olive oil gelato, there wasn’t anything about this dessert not to love. He actually was nice enough to let me have a spoonful and I fell in love. The dessert had a terrific lemon/citrus flavor. The pound cake itself actually wasn’t too heavy, making this a little bit lighter of a dessert than you would expect it to be. 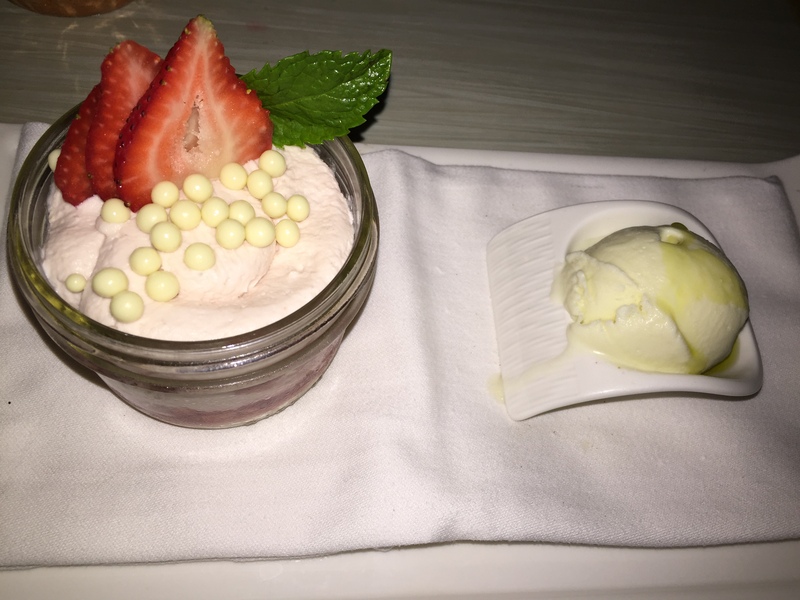 The lemon flavor with the pound cake paired really well with the strawberry compote. Berries and lemon are a good combination. The little crispy white chocolate balls sprinkled on top were terrific and gave a great crunch to the dessert. And the lemon olive oil gelato served on the side was delicious, with a great lemon after taste and a smooth feel and creaminess from the olive oil. My husband really enjoyed his dessert and thought it tasted fantastic. The Monarch Bay Club could not have been a better setting for dinner. Watching the sunset behind the cliff on the beachfront in Southern Orange County is just one of those perfect evenings. Add in dinner at a beautiful restaurant with delicious food all among a quite setting on a private beachfront and you couldn’t ask for more. This was definitely not your everyday kind of meal, The Monarch Bay Club is a restaurant best reserved for special occasions. Since most people never have access to this beach, or the club, as membership is exorbitant and extremely private, being a guest at the hotel which gave us access to the beach and the club was special occasion enough for us to try out dinner at the Monarch Bay Club. The meal didn’t disappoint and the setting was beyond believable. I’m glad that my husband convinced me to take a quick getaway to the St. Regis Monarch Beach and to enjoy the wonderful amenities that come with staying at the hotel. The Monarch Bay Club was quite the experience and one I’m glad I got to have.